Over 55 leading conservative and free market groups have joined forces to urge Congress stop the IRS from codifying its suppression of conservative groups and to stop further IRS harassment of conservatives by using the Omnibus Appropriations Bill to bring a halt to abusive changes to the IRS 501(C)4 rule. Led by our friend Phil Kerpen, President, American Commitment, the group sent a letter to Members of Congress reminding our elected Representatives that the IRS confessed to targeting conservative groups in a stunning abuse of power. And equally as important, nobody has been held accountable for these outrageous abuses. While initially blamed on a small number of so-called "rogue agents" in Cincinnati, subsequent investigations revealed that high-level IRS officials in Washington, DC actually removed case files of conservative and tea party groups from Cincinnati to Washington, where they stalled action for years, sent lengthy and intrusive questionnaires, and undermined the rights of association and speech of conservatives. Indeed, the apparent ringleader of the suppression scheme, Lois Lerner, was granted six months of paid administrative leave and then allowed to retire with her full pension. Suppression of political dissent has been rewarded. Even worse, the IRS now proposes not to rectify its own misbehavior, but to blame the victims and effectively codify its own misdeeds by adopting draconian limitations on the free speech rights of 501(c)4 social welfare groups via regulation. 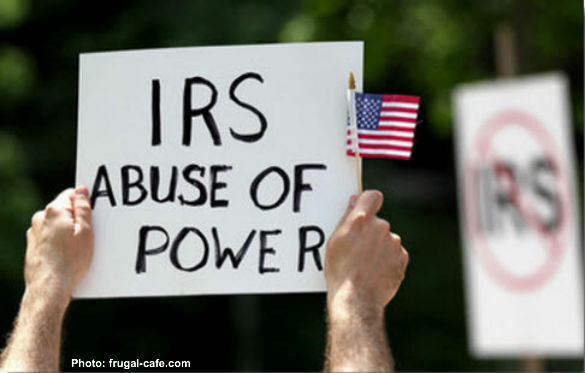 Now the IRS is doubling down on the abuses exposed in a number of congressional hearings and is attempting to put into regulation the abusive practices Congress is investigating. As Kerpen and the signers of the letter note, the IRS is now attempting bypass Congress and, through regulation, in essence rewrite Section 501(C)4 to follow their abusive practices. The IRS proposal would restrict the free speech rights of such groups by arbitrarily deeming political a wide variety of activities in the newly-created category of “Candidate-Related Political Activity,” which includes voter registration drives, candidate debates, voter guides, voting records and key votes. Now here’s the real kicker: the new IRS regulations would restrict any criticism of an incumbent federal, state, or local politician within 30 days of a primary or 60 days of a general election and effectively require groups to remove any reference to politicians from their websites during these windows. They even distort the definition of "candidate" to include appointees, so groups weighing in on executive or judicial nominations would be restricted. Not surprisingly, the new proposal would exempt unions that are the biggest financial and volunteer supporters of Democratic Party candidates. We urge you to contact your Senators and Representative (the Capitol switchboard is 1-866-220-0044) and demand that they oppose any changes to the Section 501(C)4 rules, including using the pending Omnibus Appropriations Bill to halt the proposed IRS actions. To read the full text of the letter to Congress and see the latest list of signers go here. Submitted by David Givens on Mon, 01/13/2014 - 16:28.